OADP Annual Meeting--June 27: Join us for our annual celebration, and a thought-provoking look into the past and the future of death penalty abolition. Research Fails to Prove Deterrent Effect: New analysis by the prestigious National Research Council shows that research claims for deterrence are unfounded. Death of Innocents: Exhaustive new study demonstrates to high degree of certainty that Carlos DeLuna, executed by Texas in 1989, was innocent. Your Financial Support: Our opportunities and our needs have multiplied--how can you advance the cause of repeal? 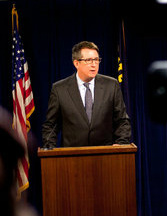 Jeff Ellis, Director of Oregon Capital Resource Center and nationally known death penalty defense attorney will be the featured speaker at the 2012 annual meeting of Oregonians for Alternatives to the Death Penalty (OADP). The general public is invited to the meeting and presentation on the Supreme Court’s 1972 Furman v Georgia decision. In the wake of four states replacing their death penalty, in the past four years, more and more attention is being paid to the discussion of the death penalty. Oregon now has a moratorium on executions and the historic perspective on the Furman decision weighs heavily on current discussions. Mr. Ellis’s presentation is an examination of the factors that led to the US Supreme Court's decision to abolish the death penalty. In the 40 years since the Furman decision, the problems with the administration of the death penalty have multiplied. Those problems should propel us to abolish the death penalty in OR, so that when the US Supreme Court halts capital punishment in America for the second time, we will be counted as a state on the right side of history. The meeting and presentation is set for Wednesday, June 27th in Moriarty Auditorium, on the Cascade Campus of Portland Community College. At 6:15PM all members and supporters of OADP will assemble for the annual review of activity and election of directors and officers for 2012-2013. Members who have contributed $10 or more during the year preceding the meeting are entitled to vote. The public meeting and presentation will begin at 7PM. The Cascade Campus of Portland Community College is located at 705 N. Killingsworth St., Portland 97217, a few blocks east of I-5. Furman v. Georgia (1972) was a United States Supreme Court decision that ruled on the requirement for a degree of consistency in the application of the death penalty. The case led to a de facto moratorium on capital punishment throughout the United States, which came to an end when Gregg v Georgia was decided in 1976. At that period of time Oregon did not have a death penalty and it was not voted back into effect until 1984. Since then Oregon has remained one of (now) 33 states with a death penalty; there are 37 people on the Oregon death row and there have only been two Oregon executions since 1984, both men giving up their rights of appeal. 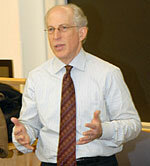 Jeff Ellis has spent most of his career practicing and teaching capital defense. As director of the Oregon Capital Resource Center in Portland, he provides assistance to attorneys involved in the defense of capital cases in Oregon. 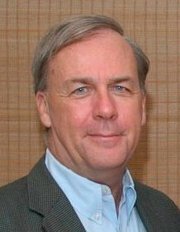 He also serves as an adjunct professor at Lewis & Clark Law School, teaching a capital punishment course that primarily focuses on the Eighth Amendment’s regulation of the death penalty. He has been invited to speak on capital punishment throughout the country. After graduating from Pacific Lutheran University in Tacoma and the University of Oregon School of Law, Ellis spent 15 years working for The Defender Association in Seattle, mostly in the felony division, where he tried more than 100 cases. During and since that tenure, he has taught capital punishment seminars at the University of Texas Law School and Seattle University School of Law and worked in private practice in a three-person firm where he was a named partner. Back to "In This Issue..."
The National Resource Council of National Academies recently reported that after examining more than three decades of research, it has concluded that all studies assessing the potential deterrent effect of the death penalty are fundamentally flawed. The report states: "The committee concluded that research to date on the effect of capital punishment on homicide is not informative about whether capital punishment decreases, increases or has no effect on homicide rates. Therefore, the committee recommends that these studies not be used to inform deliberations requiring judgments about the effect of the death penalty on homicide" (emphasis added). While studies are unable to show a deterrent effect for the death penalty, it is widely known that it is a far more expensive punishment than life imprisonment without the possibility of parole. The National Academy of Sciences, National Academy of Engineering, Institute of Medicine, and National Research Council are private, nonprofit institutions that provide expert advice on some of the most pressing challenges facing the nation and the world. Known collectively as the National Academies, this organization produces groundbreaking reports that have helped shape sound policies, inform public opinion, and advance the pursuit of science, engineering, and medicine. "Despite 41 DNA exonerations in Texas in the last 9 years, Rick Perry says he never loses sleep over executing the innocent. Perry has overseen 235 executions in Texas. Detailed research shows that the Texas death penalty system cannot insure that innocent and undeserving defendants are not sentenced to death. Death penalty exonerations have already revealed deep flaws in our State’s criminal justice system. "The application of the death penalty in Texas is disproportionately applied to the poor and minorities. The system has allowed in the past the execution of juveniles, the mentally ill and poor defendants who had such inadequate counsel that their lawyers literally slept through their trials. Other states are increasingly rejecting the death penalty as evidenced by the legislatures in New Jersey (2007), New Mexico (2009), and Illinois (2011). By an overwhelming 4-1 margin (274 in favor / 65 opposed), delegates to the New Hampshire Democratic State Convention held in Manchester on Saturday, June 3, voted in support of a resolution to repeal the death penalty and redirect funds to solve cold case homicides and support victims of crime. The secret ballot vote followed speeches to the convention by the resolution's sponsor, former Representative Renny Cushing in support of the measure, and the chair of the Resolutions Committee Dorothy Soloman, speaking of the 6-0 vote of that committee to urge delegates to reject the resolution. While the two highest elected Democrats in the state, US Senator Jeanne Shaheen and Governor John Lynch, both support the death penalty, the Keynote Speaker at the convention was Maryland Governor Martin O'Malley, a national leader amongst elected officials in the effort to abolish capital punishment. O'Malley told delegates who spoke to him about capital punishment that he was hopeful his home state would repeal the death penalty next year. Oregonians who support repeal of the death penalty should make a note on their calendar to write, call, email their friends and relatives in California and urge them to vote in favor of replacing the death penalty with life without parole. Gallup recently released its “Values and Beliefs” survey regarding American moral views on a variety of social issues. The results revealed a significant decline in the percentage of the public that finds the death penalty "morally acceptable." 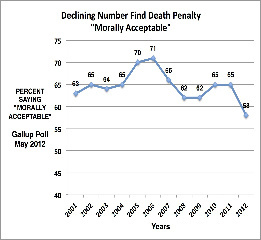 This year, only 58% of respondents said the death penalty is morally acceptable, down from 65% last year. This marks the lowest approval rating for capital punishment since this survey was first administered 12 years ago. Among Democrats, only 42% found the death penalty morally acceptable. Generally, support for the death penalty falls below 50% when the public is offered alternative punishments. In 2010, Gallup asked which is the better punishment for murder: the death penalty or life in prison without parole? Less than half (49%) chose the death penalty, while 46% chose life without parole. August 18 Salem Unity Peace Fair, 1777 Fabry Rd. SE, look for OADP booth. August 30- Sept 2 Corvallis Wild Goose Festival (Benton Co. Fairgrounds), look for OADP booth. October 22-26, Eugene, Salem and Portland. Sister Helen Prejean returns to Oregon. Details, to be announced. OADP is able to advocate for death penalty repeal only because of the financial contributions of supporters like you. With Governor Kitzhaber's bold announcement of his support of repeal, our opportunities and our needs have multiplied. There is a great deal to do if we are to place a measure on the ballot in the near future. Please consider how you can help us raise the funds to educate Oregonians that we will all be safer without the death penalty. If you know anyone who is able to make a large donation, or many people who can make smaller ones, your active commitment to this cause is necessary to our success. Thank you for considering what you can do to move us forward.